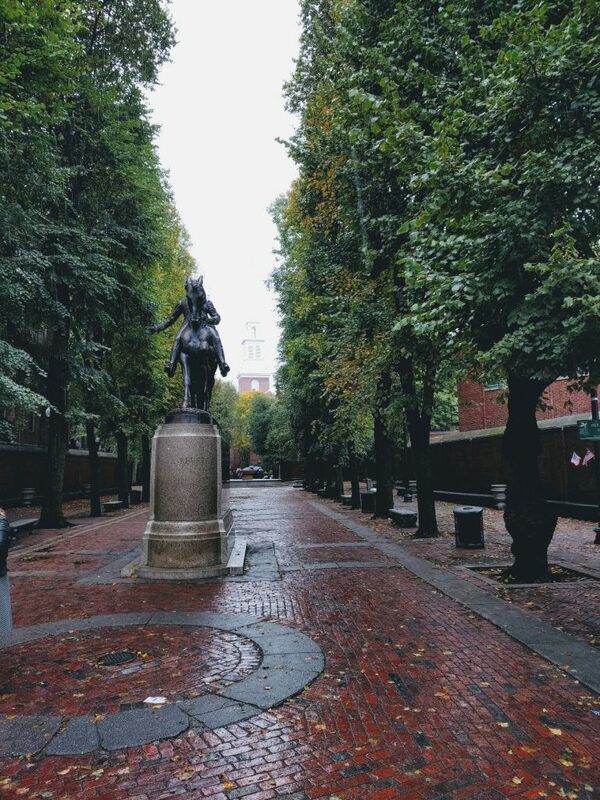 Elizabeth has a fall break each year and we decided to make the most of it by visiting Boston for the weekend. Don’t worry if you aren’t visiting in the fall! 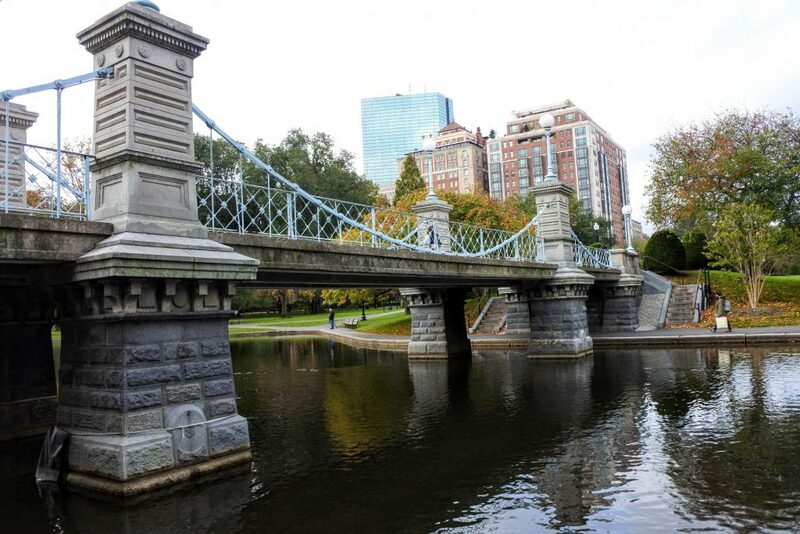 This 2 day Boston itinerary works for most seasons and most travelers. As usual, we decided not to waste a single minute exploring this historic city. You can see an amazing amount of Boston in two days by following this plan. 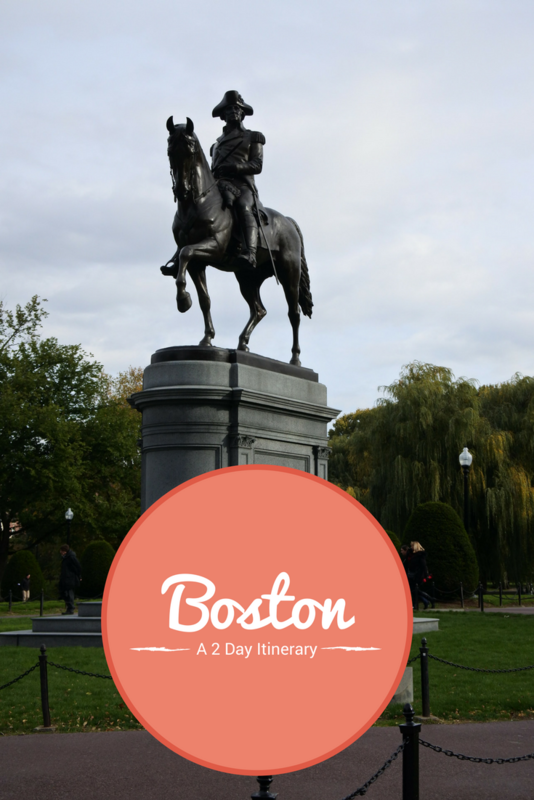 This is a step by step detailed itinerary for our Boston trip. 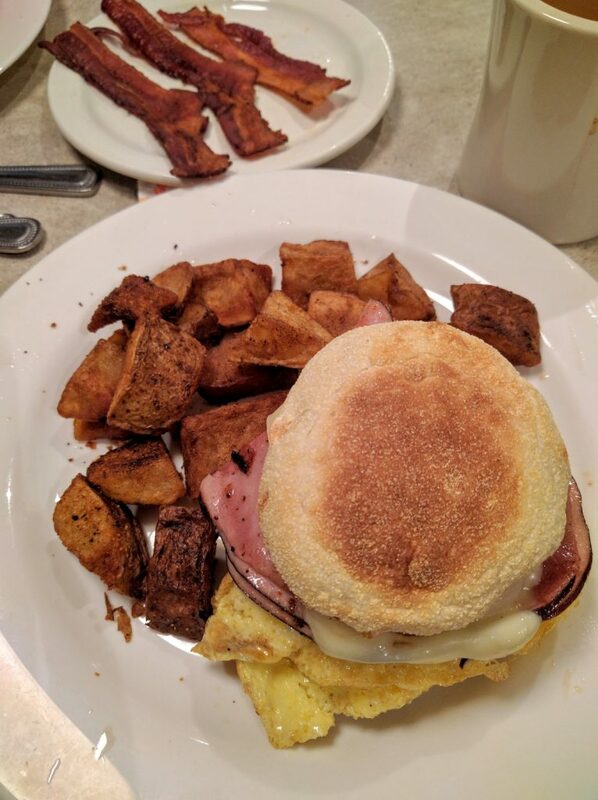 If you are looking for a Cliff’s Notes version of what to pack for Boston, what to see in Boston and what to eat in Boston I have those for you, too. Since we arrived late the previous evening we didn’t have a proper dinner. We woke up very hungry on our first morning so we started with a very hearty breakfast at this slightly quirky restaurant. Although this is a sit down restaurant you are not seated until after you order. You enter the restaurant, walk to the back and order directly from the cooks. From here you pay at the register. After paying it is time to get seated and dig into way too much good food. 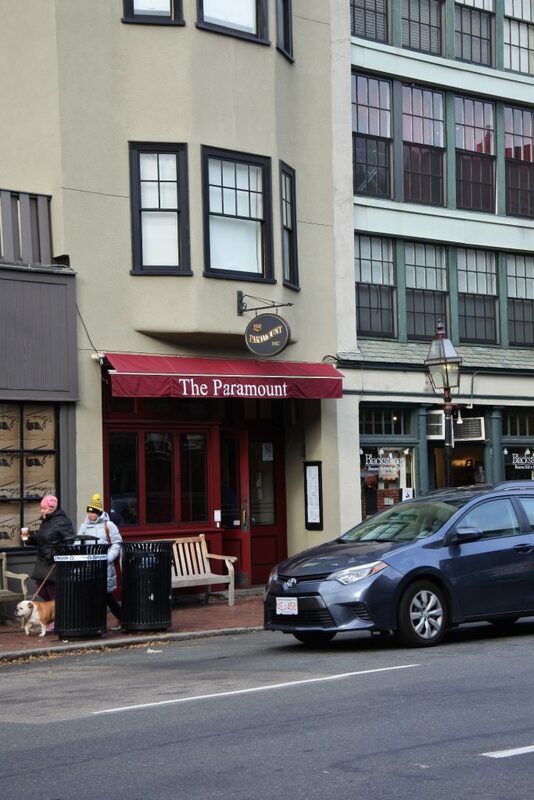 The walk from The Paramount to the Public Garden only takes a couple of minutes. First, we visited Mrs. Mallard and her eight ducklings from Make Way For Ducklings (buy from Amazon). In fact, I highly recommend the Make Way For Ducklings book for kids going to visit Boston. It is about Mr. and Mrs. Mallard who want to find the right home for their future family in Boston. 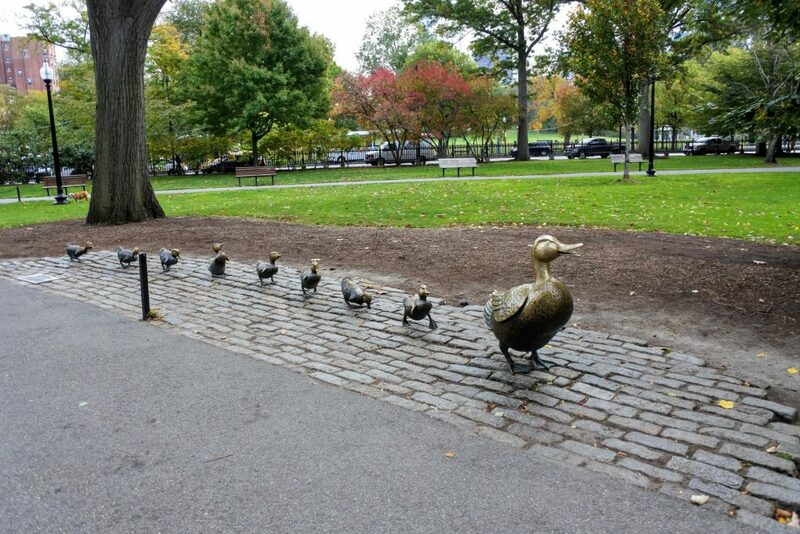 The ducks explore many spots in the city and this helps familiarize your own little one with Boston sights. After leaving Mrs. Mallard we explored the rest of the Public Garden. There is a beautiful bridge overlooking the 4 acre pond at the center of the garden. This pond hosts ducks, swans and swan boats in warmer weather. What is a swan boat you ask? It is a small boat decorated like a swan that is propelled through the water by a driver who pedals around the pond. There are also formal gardens and several statues throughout the property. It was quite pretty even in the fall without the flowers. I imagine that in spring or summer it would be stunning. 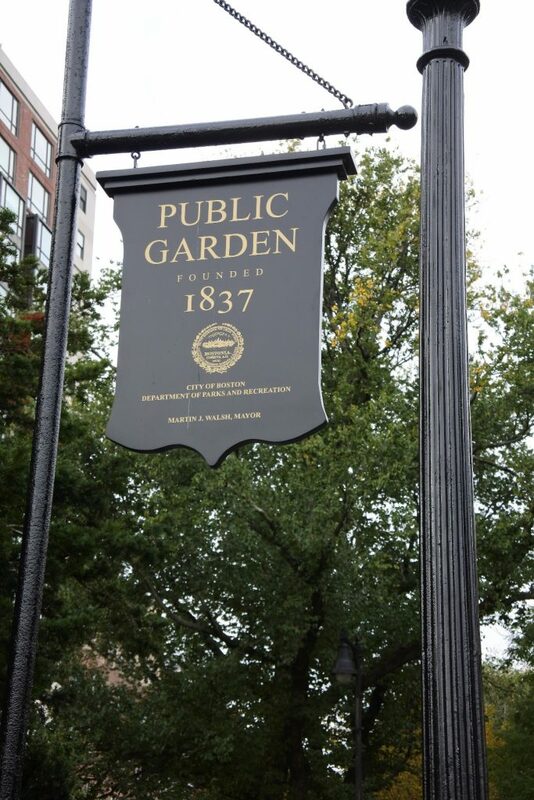 From the Public Garden we walked across Charles Street through Boston Commons to the visitor’s center at 139 Tremont Street. We had pre-purchased our guided tour through Groupon and met our costumed guide outside the visitor’s center. If you haven’t pre-purchased your tour head into the visitor’s center where you can sign up for same day tours. You will also find restrooms inside since on most of the tours there are no bathroom breaks for the duration of the walk. We walked roughly the first half of the Freedom Trail (a 2.5 mile trail that brings you past 16 historic sites) with our guide. 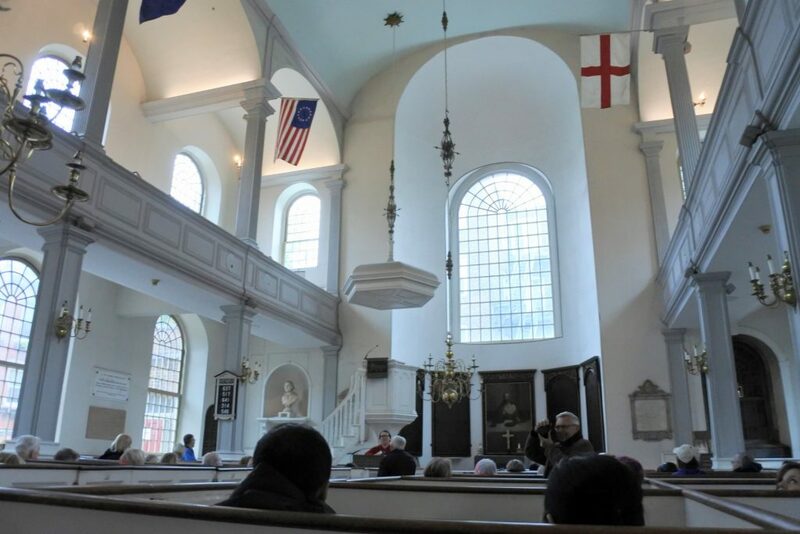 On our tour we saw the Massachusetts State House, Park Street Church, Granary Burying Ground, King’s Chapel, the Benjamin Franklin statue at the original public school (Boston Latin School), Old South Meeting House, the Site of the Boston Massacre and ended at Faneuil Hall. After all of our walking we were ready for some lunch. 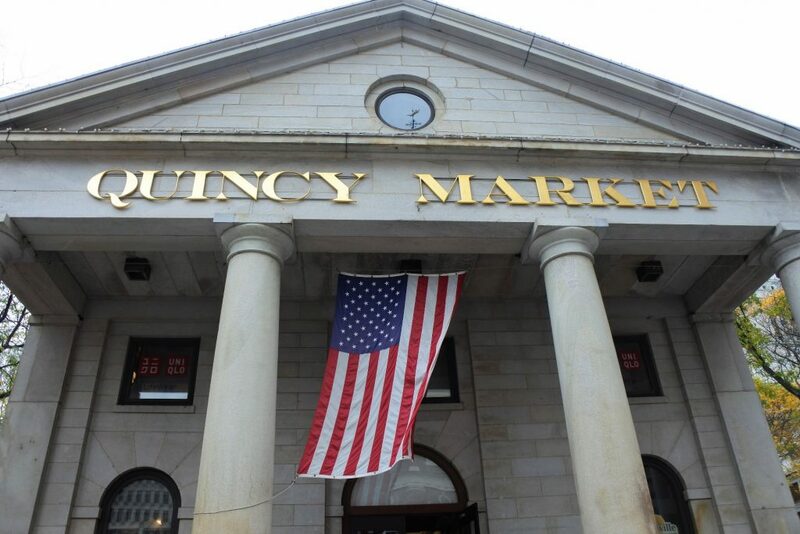 Located right behind Faneuil Hall is Quincy (pronounced quin-zee) Market. In this large building food booths abound. There are choices that should satisfy even the most picky eaters of your group. Once you find your food of choice (ours was fresh carved roast beef, roast potatoes and green beans) you make your way to the center atrium where communal tables are available. Originally I had planned for Elizabeth and I to visit the aquarium after our lunch. However, the weather forecast for the next day was calling for large amounts of wind and rain so I decided to save the indoor activity for the following morning. 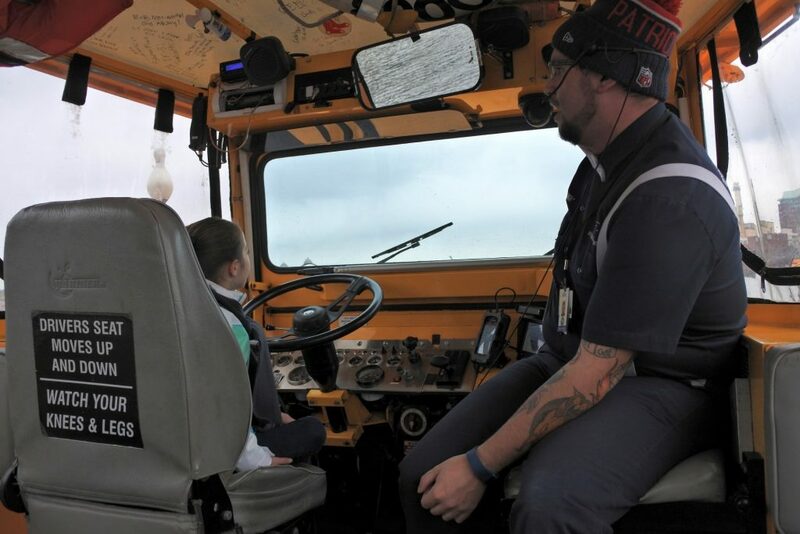 It was an easy 8 minute walk to the Duck Tour booth from Quincy Market. 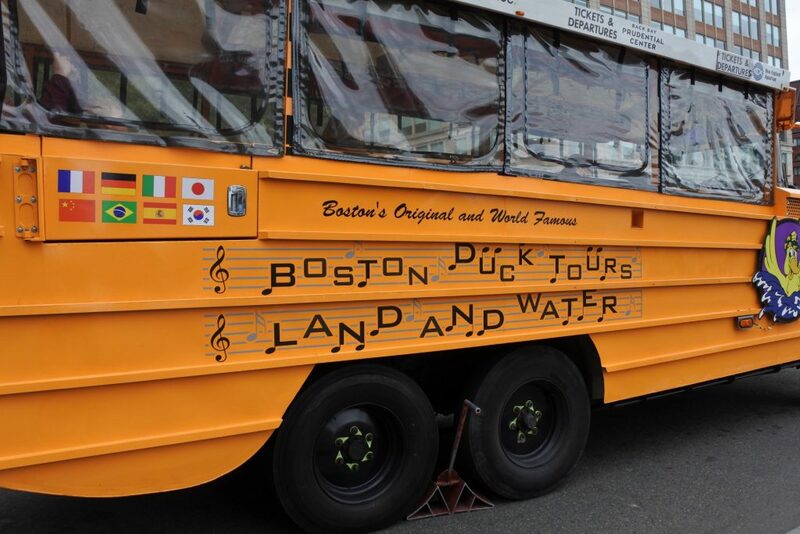 Boston Duck Tours is a 90 minute land and water tour that drives you past several Boston landmarks before driving you into the Charles River (which I admit was weird). The Con-Duck-Tor talks about the sights of Boston and peppers the stories with some pretty terrible jokes along the way. If you have ever dreamed of captaining your own vessel this could be your chance. Once on the Charles River some lucky passengers are allowed to steer the ship. Our intention was to pick up Mr. Smart Mouse from work (poor guy was here on a work trip while we were having fun) and then explore Cambridge. Unfortunately, by the time he was able to leave work we had to take the T straight back to our hotel to freshen up for dinner. If you aren’t picking up Mr. Smart Mouse I imagine you could easily have time to walk the campuses of MIT or Harvard. This cute restaurant is nestled in the narrow streets of Boston’s North End (the Italian area of the city). We opted for 3 dishes: wood-fired pizza, fettuccini panna e prosciutto, and roast chicken. The food was good and the place was very family friendly. In fact, there were several tables with small children when we had dinner. I was so hungry I forgot the before picture! Somehow we managed to leave a little room for dessert after dinner. 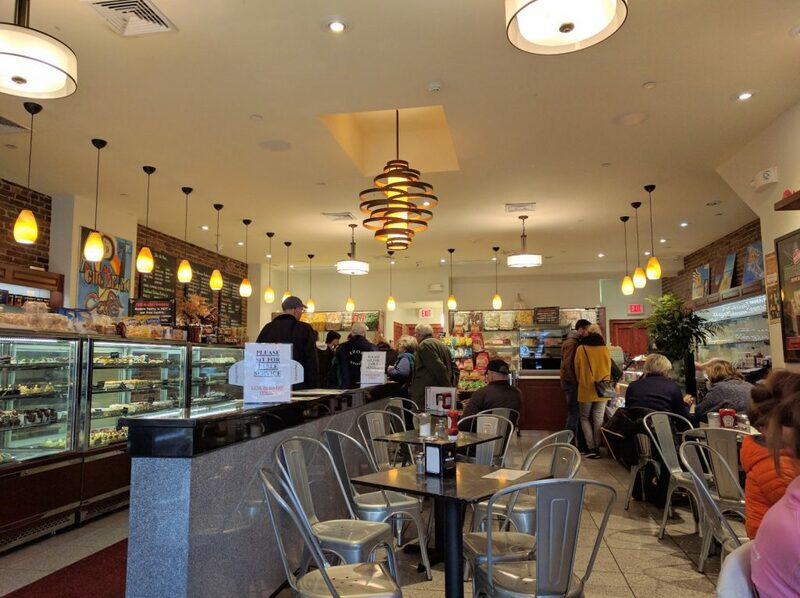 I am so committed to finding the best sweets that we walked the couple of blocks from Antico Forno to Mike’s in the pouring rain. When we arrived the place was mobbed at 8:15pm on a Thursday. Although it was busy, we barely had time to look at all the cases before it was our time to order. 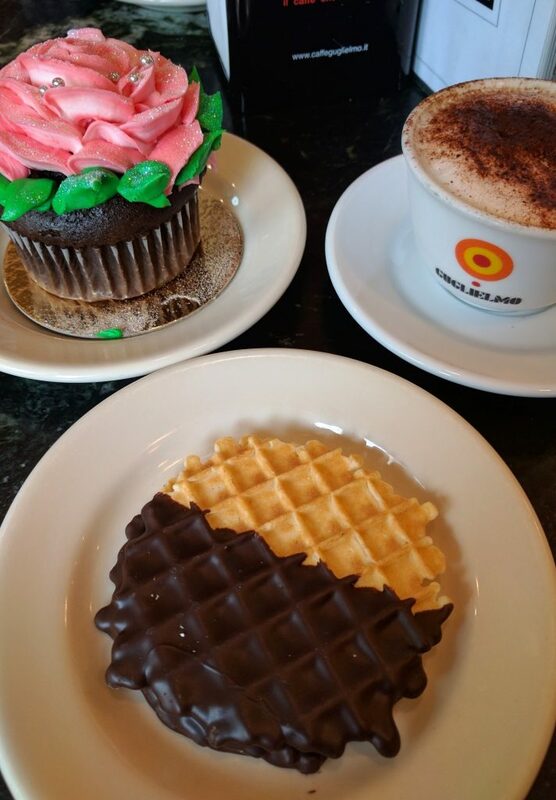 Our choices were a whoopie pie, a cupcake and cuccidati (Italian fig cookies). Our treats got boxed up to-go and we took an Uber back to our hotel for our late night snack. Everything was so, so, so good. I highly recommend Mike’s. 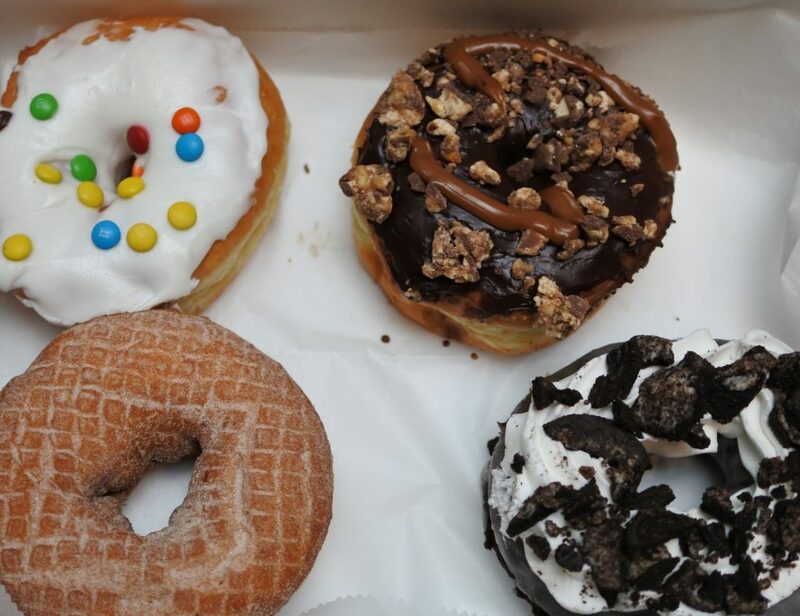 We started our day my favorite way – with donuts! 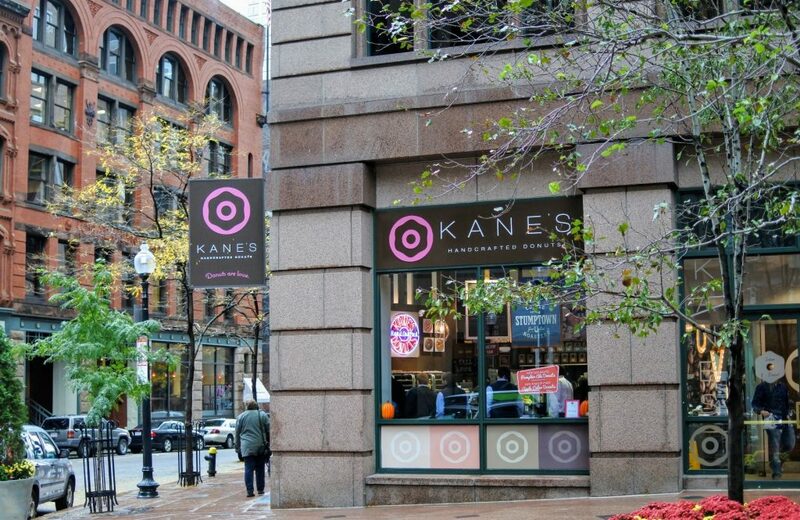 We were going to the New England Aquarium and of the well reviewed donut places Kane’s was the nearest. In fact, it is only a 10 minute walk from Kane’s at 90 Oliver Street to the aquarium. 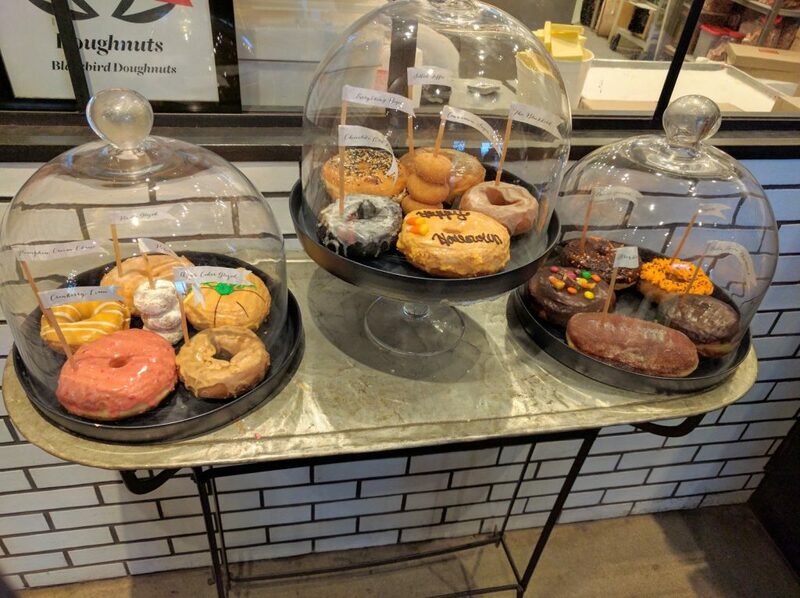 There were several great looking donut options. We opted for Snickers, cookies and cream, M&M, and cinnamon sugar. All of them were delicious. If I could go back I would order a Snickers all for myself instead of having to sneak bites of Mr. Smart Mouse’s donut. Although there is no seating inside Kane’s itself there are many tables available inside the lobby of 2 International Place next door. 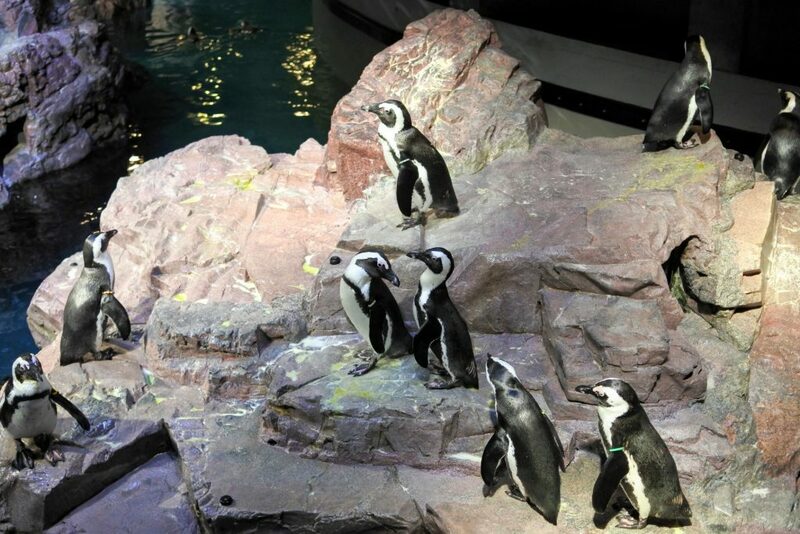 When we first entered the aquarium our first stop was the penguins. I am a sucker for penguins. From here we looked at the tanks lining the outside edge of the main floor. The Giant Ocean tank holds 200,000 gallons of water and contains more than 1,000 animals. This tank is the centerpiece of this area. Before walking up the ramp to see all of this giant tank we went outside to see the trainers working with the Harbor Seals. The seals were so much fun to watch! After the show we re-entered the building and went across the hall into the Shark and Ray Touch Tank. This tank contains gentle cownose rays, Atlantic rays, and epaulette sharks. There is a small ledge where shorter kids may stand to reach into the water. 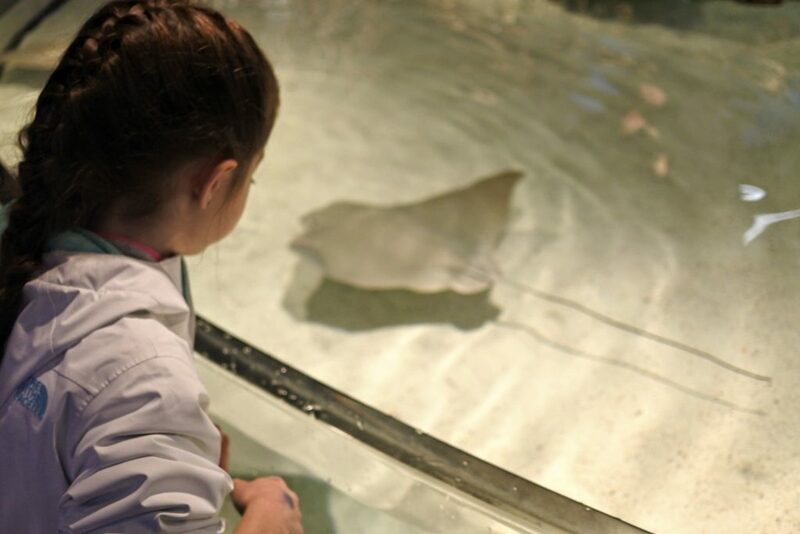 At first Elizabeth was hesitant, but as soon as I gently touched a ray she was ready. I was surprised how velvety the skin felt! After touching the rays and sharks we washed our hands at the convenient hand wash station. From here it was finally time to check out the Giant Ocean tank. There were touch screens located along the tank to help identify what creatures were inside which we thought was helpful. Once we reached level 3 we had to make a detour to the Edge of the Sea Tide Pool. This is another hands-on exhibit. 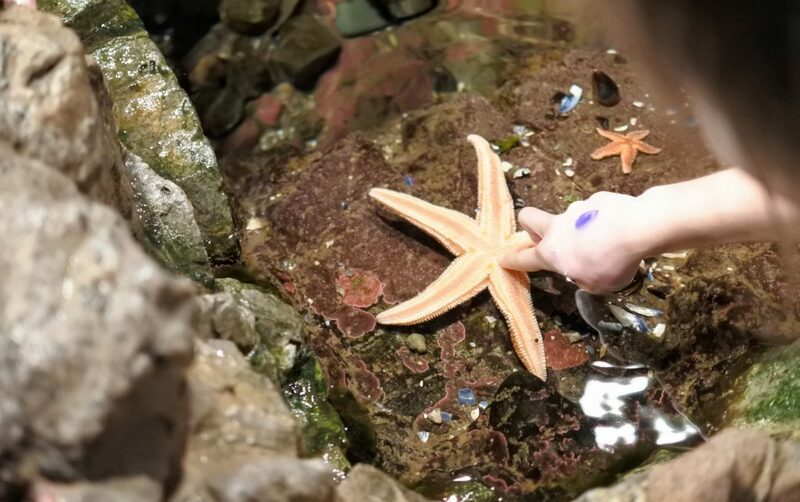 Here you can touch sea stars, hermit crabs, and sea urchins. The staff is friendly and answered any questions we had. Eventually we made it to the top of the Giant Ocean Tank to admire Myrtle the Turtle. 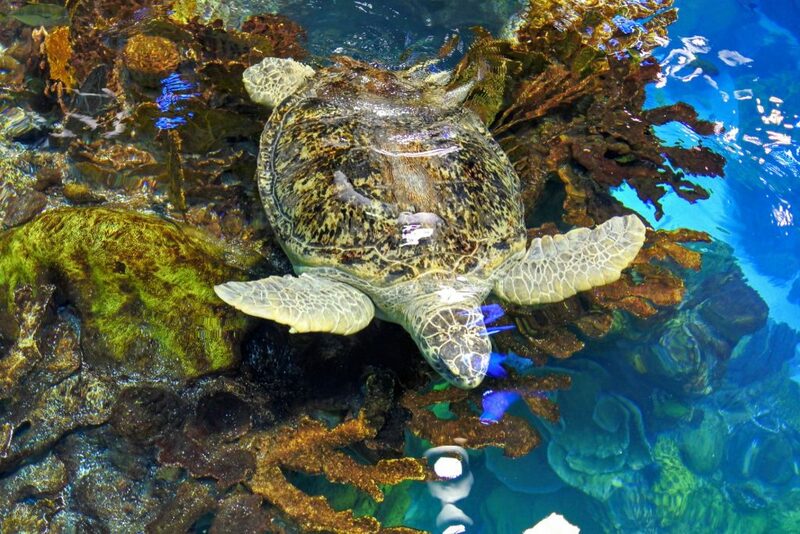 Since 1970, Myrtle has been a resident of the aquarium. She was much larger than I had imagined, but moved so gracefully through the water. We bid Myrtle good-bye and decided it was time for lunch. Now I know this isn’t a Boston institution, but hot soup sounded amazing on our cold rainy day. This Panera was only a short walk from the aquarium and didn’t take us out of our way for our next stop. From Panera it was only a 12 minute walk to the Paul Revere house so this is where we resumed the Freedom Trail. 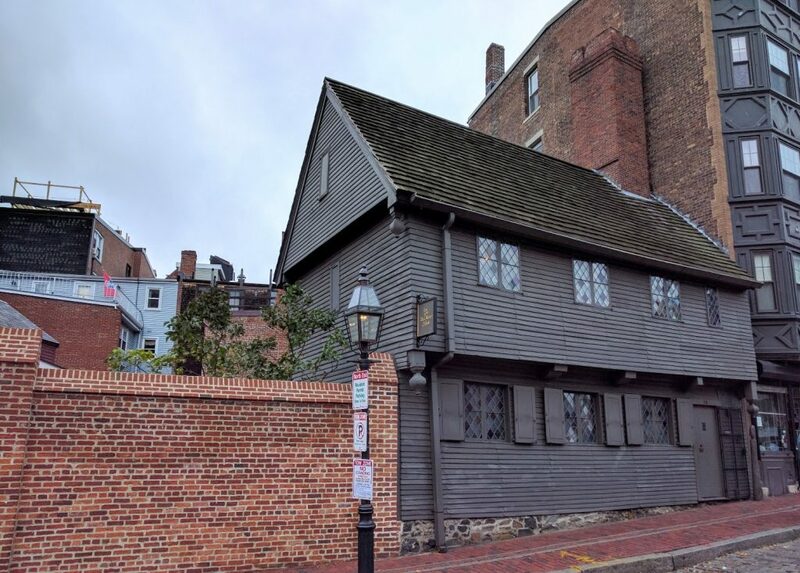 Paul Revere’s house is one of the stops on the trail that does charge an admission. We went ahead and paid the fee to see the inside of the house and learn a little more about him, his family and life back then. One of the most interesting things was a bell located in the courtyard that was cast by Revere’s company. 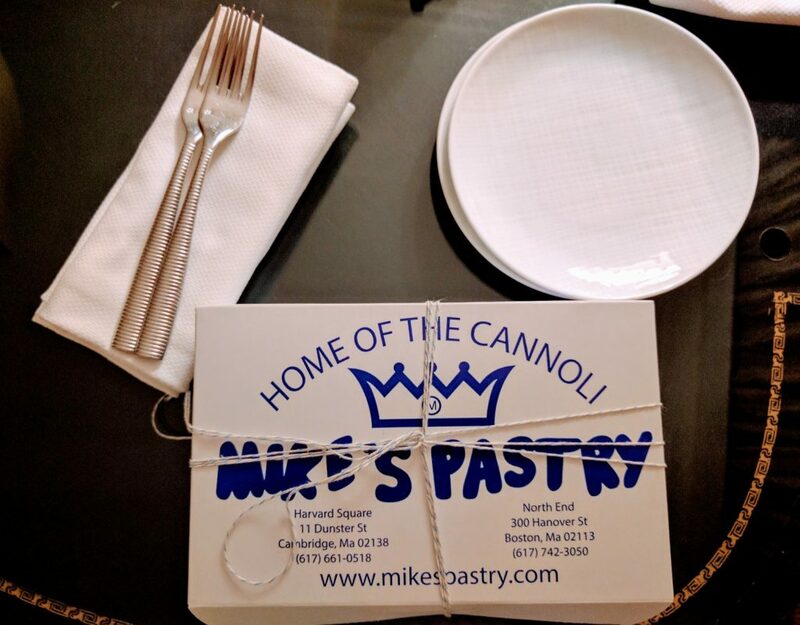 As we were walking from Paul Revere’s house toward Old North Church I realized we were only a half block away from Modern Pastry (another highly recommended North End bakery). We decided a cappuccino and some sweets would help us sustain our strength so we stopped. If you order at the counter your order will be packaged to-go. You may only eat at the tables if you order at the tables so that is what we did. Elizabeth’s cupcake was a work of art and must have been really good since she refused to share. Once we were warmed up and had full tummies we resumed our walk. This church’s steeple is where the “one if by land, two if by sea” lantern signal is said to have been hung during the ride of Paul Revere. There is no fee to enter the church and guides speak every few minutes about this historic church. On your way out there are donation boxes if you would like to help maintain the landmark. When we were getting ready to leave the church the promised rain really got started. 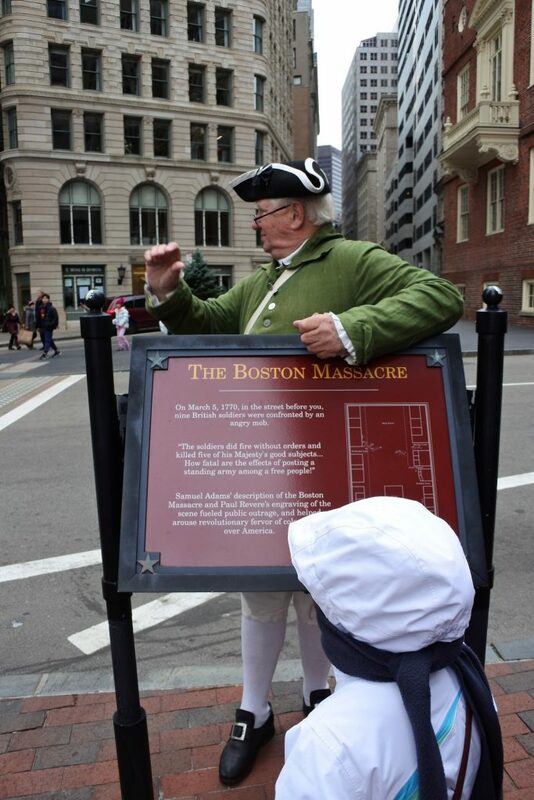 Unfortunately, due to the weather we had to skip Copp’s Hill Burying Ground and the Bunker Hill Monument. 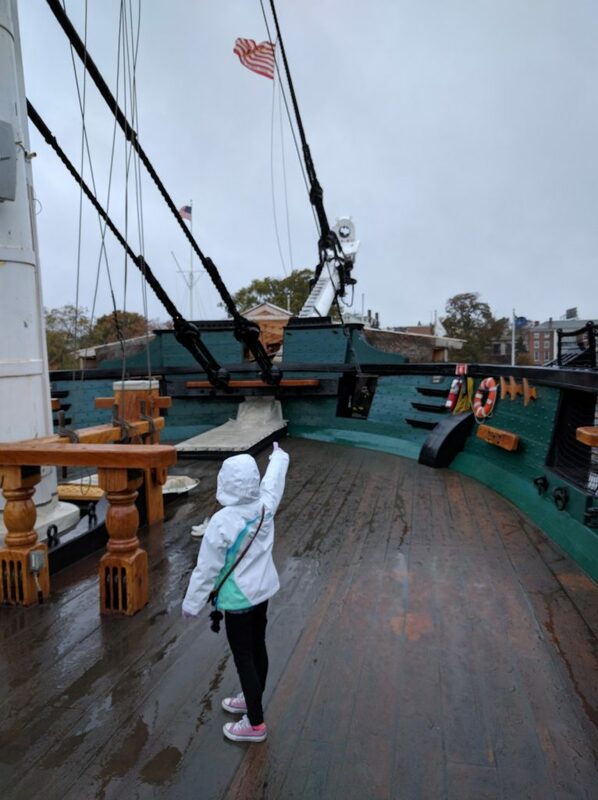 We were looking so forward to setting foot on “Old Ironsides” that not even pouring rain could dissuade us. 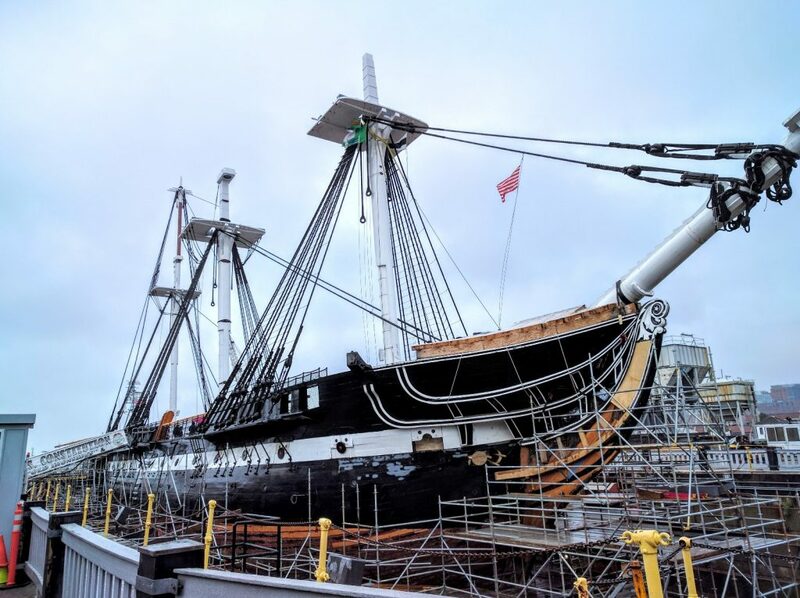 We took an Uber from Old North Church and made our way to this iconic ship. U.S.S. Constitution is still a commissioned ship and so there are members of the Navy on board. We went below deck to see what it would have been like to work on this massive ship. Once it seemed the downpour had lessened we went back topside to admire the beautiful ship’s main deck. It was hard to believe we were actually standing on this famous ship originally launched in 1797. Next we went into the U.S.S. Constitution Museum located next door to the dock. This was another museum with a suggested donation. There were many hands-on exhibits to teach about the War of 1812, how ships like the U.S.S. 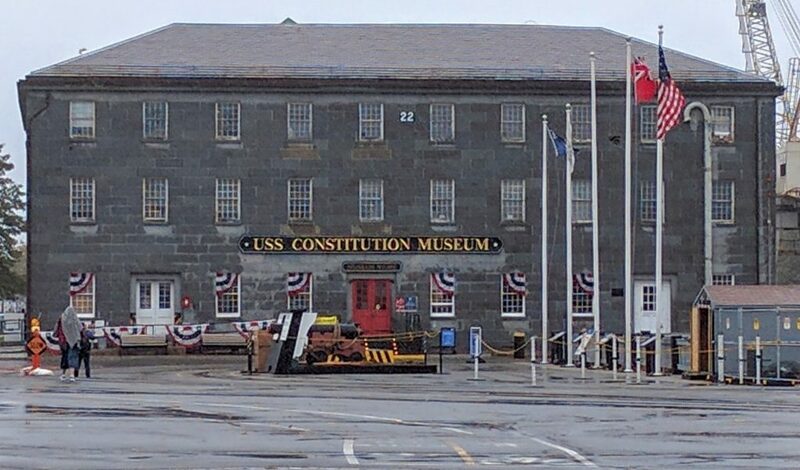 Constitution were built, and what it was like to be a sailor in the beginning of our Navy. 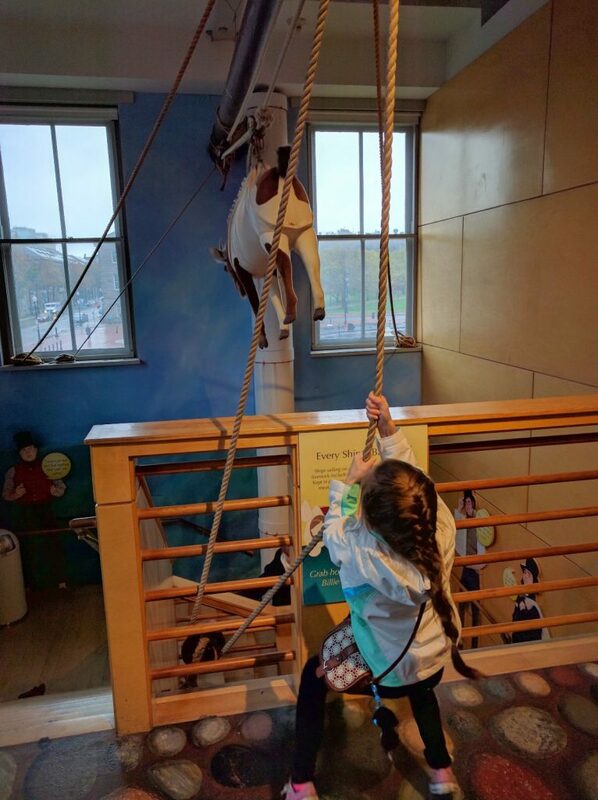 We spent nearly two hours exploring the exhibits (and could have stayed longer), but it was almost time for our dinner reservations. This was hands down the most amazing meal we had in Boston. I do not like seafood, but since we were on the coast I felt like we should go to a seafood restaurant. I am so glad we did! Mr. Smart Mouse ordered the waitstaff recommended blackened Chilean Sea Bass. Elizabeth and I shared steak and scallops (I figured I should try something from the ocean). Poor Mr. Smart Mouse barely got half of his fish. 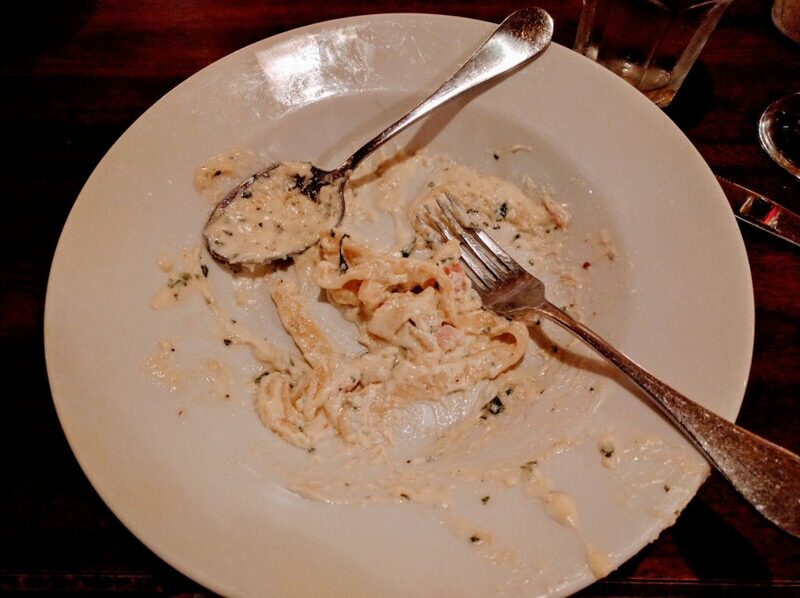 It was so delicious that Elizabeth and I gobbled it up. The scallops were also amazing, rich, buttery goodness. The steak was good, too, but paled in comparison to the amazing seafood. 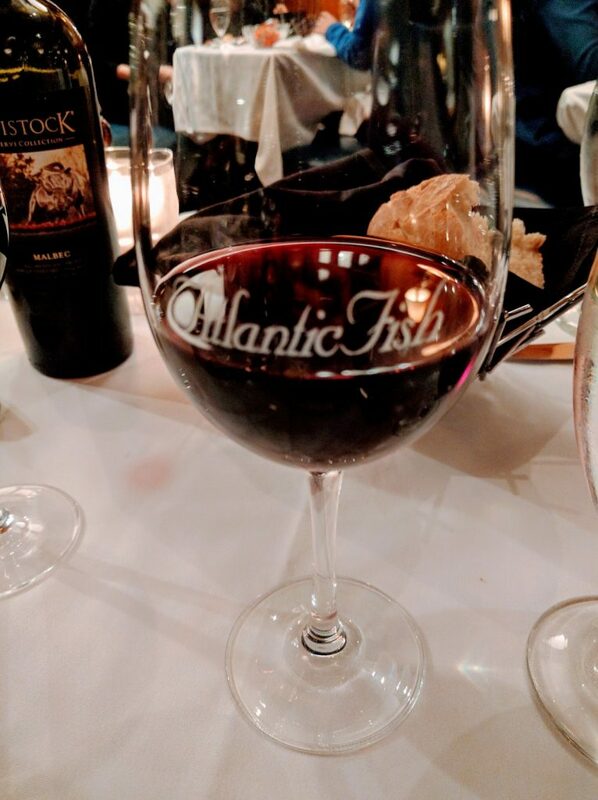 I highly recommend reservations for Atlantic Fish Company. Please note this is the kind of restaurant where you linger over your meal. There were a couple of other children present, but if you have kids that get antsy quickly you may want to skip here. We went back to our room and started the sad process of packing for our trip home. 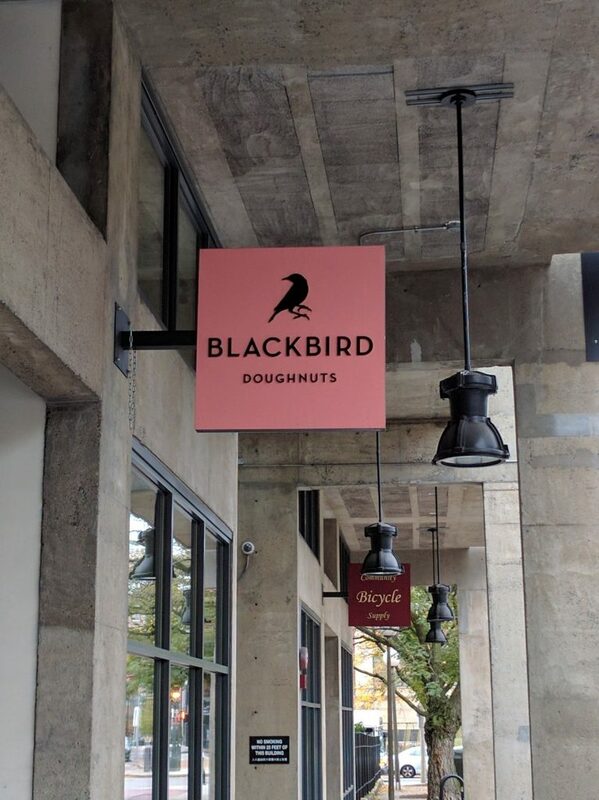 We always try to do at least a little something on our travel day home so our first stop was Blackbird Donuts. This self-proclaimed artisanal donut shop had great style. I loved the way it looked. 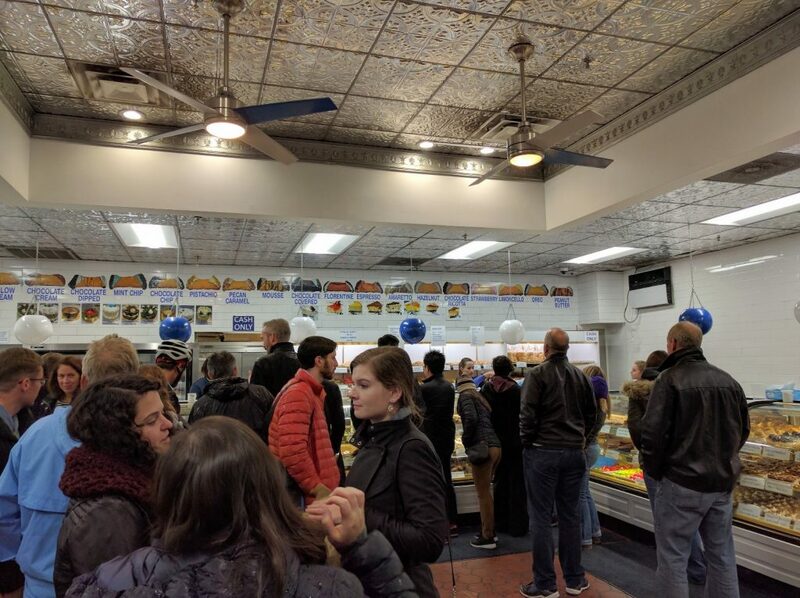 There was only a small area to wait to order your donuts and no tables available for eating. Since Blackbird was only about a mile from our hotel this worked out fine. We got our donuts, coffee and milk to-go and walked back to our hotel room to eat. Bonus: we walked off some of the donut before we even ate them! I highly recommend the cranberry lime donut if it is available. The donuts were good, but as a family we all agreed that Kane’s was the winner of our Boston Donut Challenge. After breakfast we made sure everything was packed, dropped the bags at the bell desk and went to our last stop. Of course it was sunny and 60 degrees on our travel day! We enjoyed the mild weather and sunshine on our walk to the Boston Public Library. This library is a bibliophile’s dream. 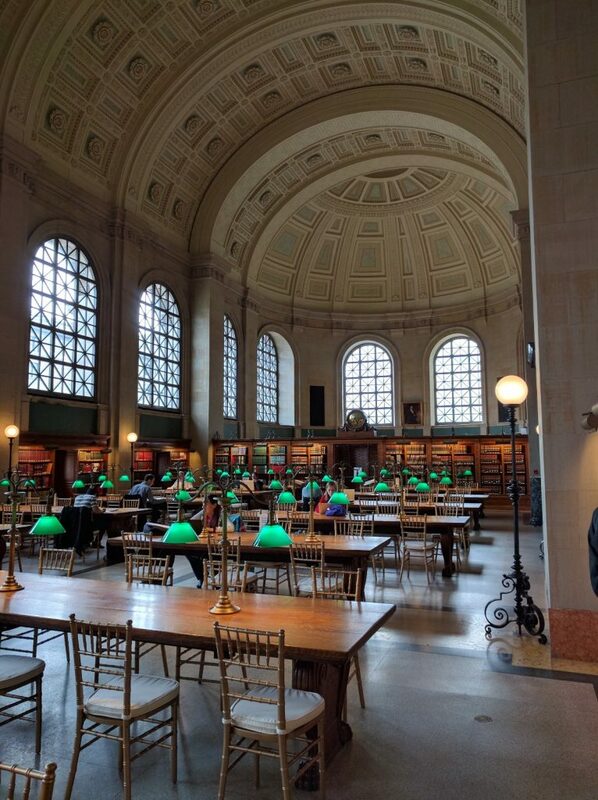 I could have spent all day writing at the long wooden desks with the classic green library lamps. Instead, we wandered the library until we found the children’s section. 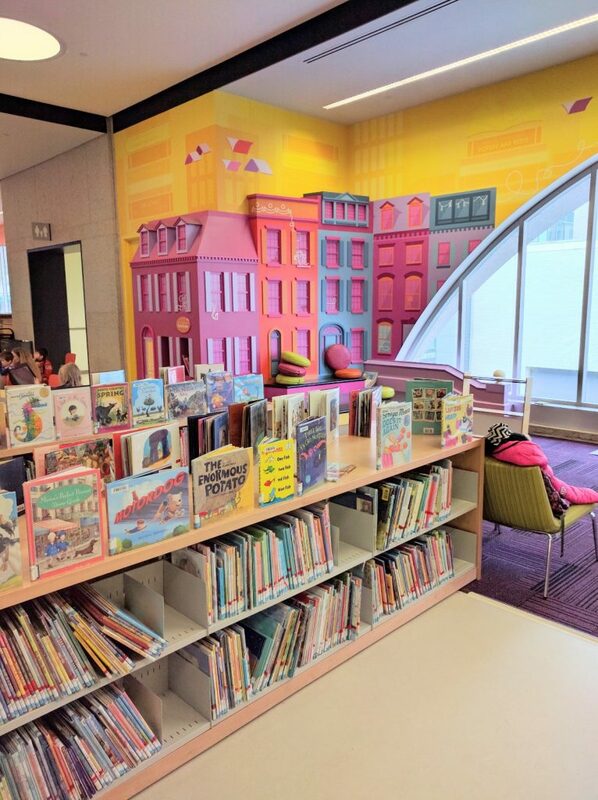 We grabbed a book, snuggled into a big comfy chair and shared a story in the large, colorful room. Before long it was time for us to head to the airport. As you could see, we experienced a lot that Boston has to offer in just 2(ish) days. I can not recommend Boston enough to you. It is a very walkable city with amazing history, sights, and food. Elizabeth talks about the trip often and we can not wait to make our way back to this great city again. 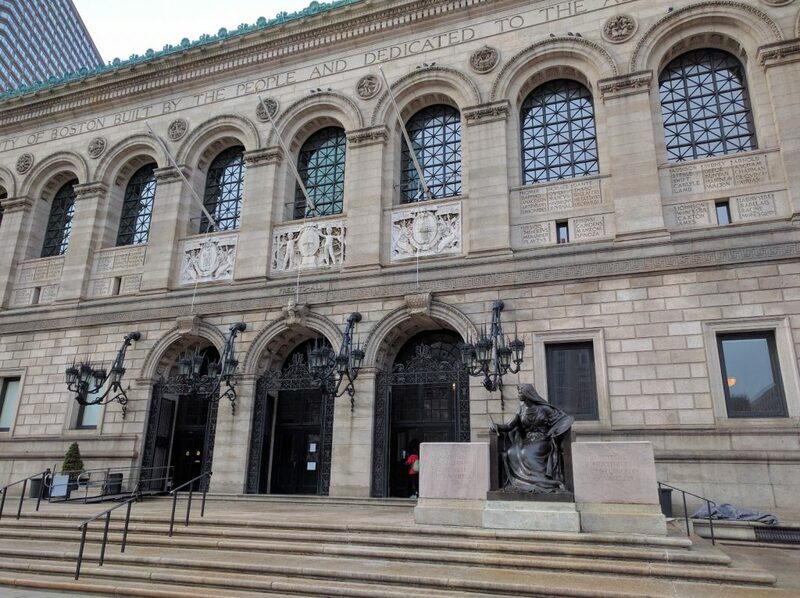 Please let me know if you use my Boston itinerary – I would love to hear how it worked for your group!